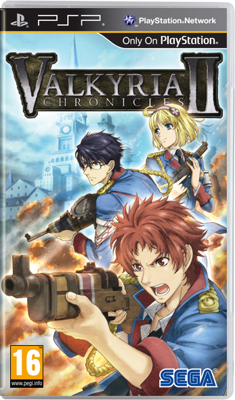 The story of Valkyria Chronicles II on PSP takes place two years after the conclusion of the original PS3 game. A group of young Gallian Military Academy cadets find themselves plunged into a bitter civil war when the newly formed Gallian Revolutionary Army stages a coup. As the epic drama unfolds in the game, players will experience stories of friendship, love and growing pains during a time of war and revolution. The "CANVAS" engine, originally developed internally by SEGA Game Studios Japan for Valkyria Chronicles on the PLAYSTATION 3, is being fully redesigned for the graphical capabilities of the PSP. This incredibly distinctive engine will power over 20 new distinct and visually stunning environments within which players will have hundreds of different missions to explore. Valkyria Chronicles' "BLiTZ" battle system has also been re-designed for Valkyria Chronicles II on PSP to offer players the freedom to strategically move around the environment and attack enemies using real-time controls, something never before seen in the tactical role-playing game genre.